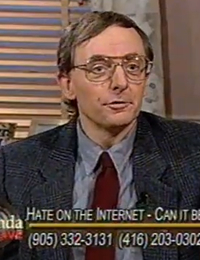 On July 23, 2001, Robert Metz (President, Freedom Party of Ontario) was a guest of Rhonda London Live. In this episode, Metz discussed with host Rhonda London the erosion of privacy on the Internet (but also in other situations, including the Canadian census). Also guests in this episode: Ann Cavoukian (Ontario’s Information and Privacy Commissioner), and Rick Penton (Canadian Information Processing Society). Robert Metz – Rhonda London LIVE: Does Bill 155 (Asset Confiscation) Go Too Far? Paul McKeever – Rhonda London Live: Should Voting Be Mandatory?